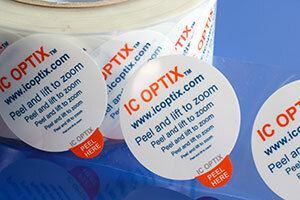 IC Optix patented magnifier label technology brings a new and innovative functionality to product labels. Most consumers have seenÂ product labels that have a multilayer design. Conventional multi-layered labels are commonly used to provide additional space to accommodate more text. Consumers are familiar with labels that have a surface layer that peels up to reveal additional information. 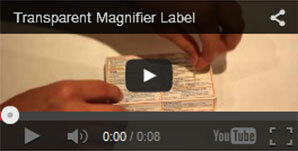 The magnifier label works in a similar manner and is intuitive. 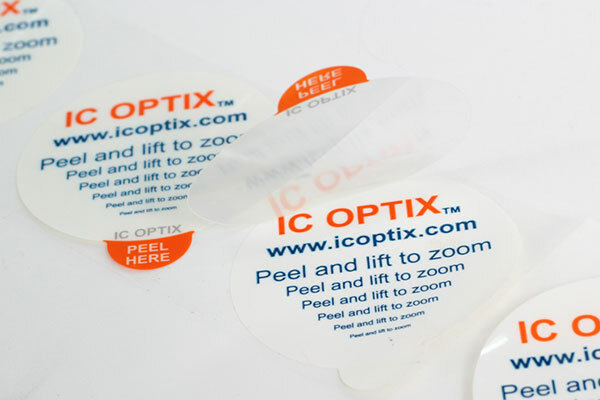 IC Optix magnifier label technology enables brand owners to integrate a thin film magnifier layer into standard product labels. The magnifier layer can be a component of the design of the primary product label (read more) or it can be a separate transparent label (read more) that is placed over the top of the primary product label for simple implementation without the need for redesign of existing label or graphics. An example of each is shown below. Brand owners that associate the magnifier label technology with their products will be providing the consumer or patient with a convenient vision aid that can be used to read print that is often too small to easily see. 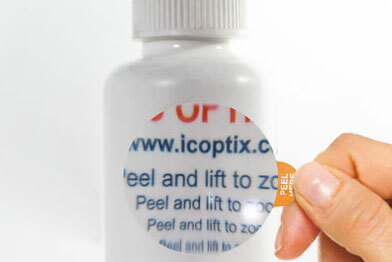 The functionality and convenience of the magnifier label will lead to an increase in the number of people who will read the important information on product labeling. This will increase compliance with proper use of products while decreasing the chance of medical error in the use of drug products. The IC magnifier label technology has been designed to be highly scalable, low cost, and readily integrated into a manufacturer’s standard packaging and labeling processes with a low impact on operations. 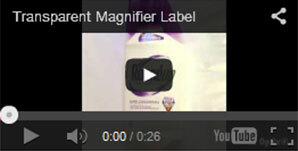 The images below show examples of the magnifier label as a printed primary product label, as a transparent over-label, and an example of the magnifier lens layer in use. 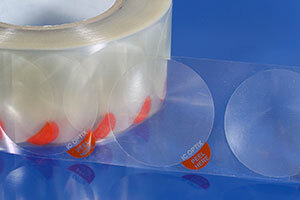 The magnifier lens layer can be re-adhered to the surface of the label for re-use at a later time. 80% of people over 40 years old have trouble reading important information on labels for medicines, foods, and other products1.